It’s pretty obvious by now that I am a HUGE fan of anything Southwestern/Mexican/Tex-Mex (my perfect meal would consist of giant vats of guacamole and chips, these margs, these pretzels and dip, these pizzas, and these burgers. Yeah. I’m a fan.). Tacos are no exception. It’s not always the lightest cuisine, though. There are certain things that are hard to lighten up, and I find tacos to be one of them (unless you’re doing a seafood variety). They can get pretty heavy pretty fast. Because, really, it’s all about the toppings. The more cheese and sour cream, the better. 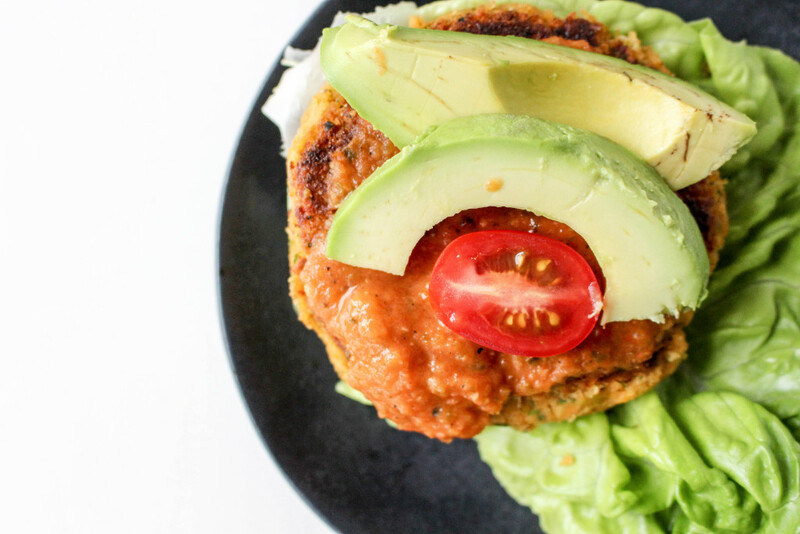 In an effort to lighten up one of my favorite foods, I made a healthy vegetarian Tex-Mex burger. Now, I know what you’re thinking. 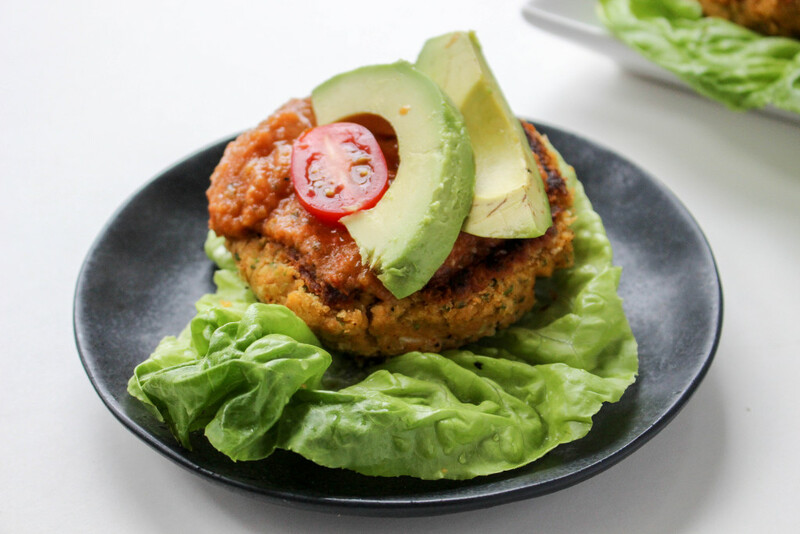 Veggie burger? Healthy? Delicious? Blah. But listen! These babies are gooooooood. They almost remind me of a Southwestern falafel. 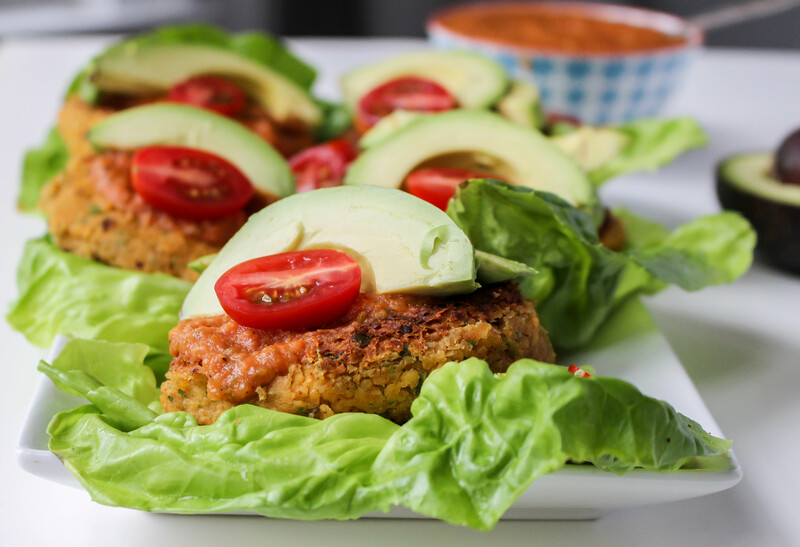 They’re loaded with flavor and spice and pack a punch in the nutrition department, but they’re light and delicious too. I served these up with a smoky, slightly sweet homemade salsa. Dooooo it. I feel like the salsa is just necessary. It’s a great way to use up so-so tomatoes, too. You roast them until they get all juicy and sweet and heavenly. The jalapenos add that perfect spice, and the lime juice and vinegar give it that lovely acidity that you need with salsa. It is soooo good. 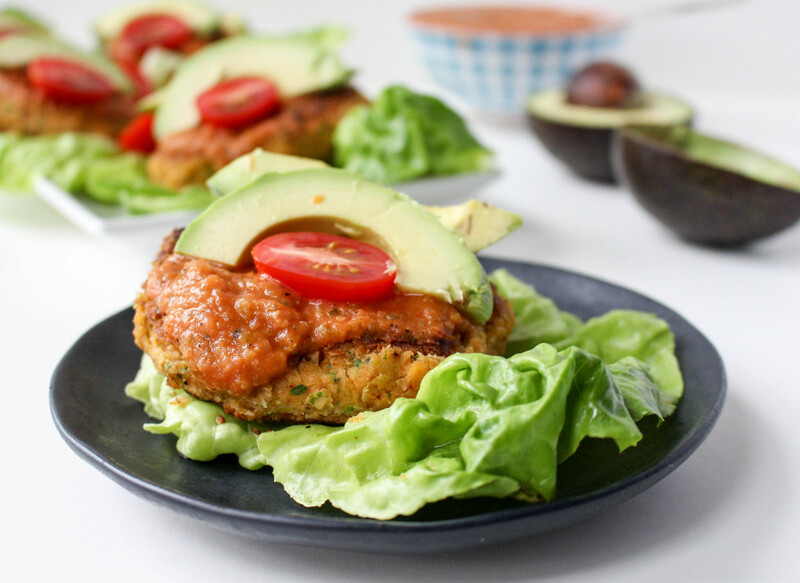 I also went bunless for these and opted for butter lettuce instead, but you can totally serve them up on a bun or in a tortilla, if you’re feeling saucy. Speaking of tortillas, I had a major brain fart when photographing these. I intended to serve them with crushed tortilla chips on top (and that is how we actually ate them), but when putting these together for their beauty shots, I FORGOT THE CHIPS. Gasp. I know. I don’t know that I’ve ever forgotten chips of any kind ever before in my life. Like, ever. So yeah, don’t be like me. Top yours with the chips. It MAKES them. Along with the salsa and buttery avocado. And hey, washing it down with a margarita isn’t such a bad idea. Margarita Tuesday, anyone? That makes these burgers sound kind of high maintenance, doesn’t it? But they aren’t! As long as you make your salsa ahead of time (which you should do anyway because it gets better the longer it hangs out in the fridge), these come together in no time at all. Super easy, minimal clean up. No fuss, no muss. Sounds like a pretty great way to enjoy a “taco” on a Tuesday, huh? Line a rimmed baking sheet with tin foil. Spread the tomatoes, onions, garlic, and peppers out evenly on the sheet and season with the paprika and cumin. Drizzle everything with the olive oil and toss with your hands to evenly coat. Place the baking sheet under a broiler for 5-8 minutes total, watching constantly and turning everything a couple times. Once things are nicely charred in spots, remove from broiler and allow to cool slightly. Put the broiled veggies in a food processor and add the vinegar, lime, sugar, fresh herbs, and a pinch of salt and pepper. Pulse to desired consistency (I like mine pretty smooth). Taste and adjust for seasonings, as necessary. Keep in an airtight container in the fridge. The longer this sits, the better it gets. Place all the ingredients into a food processor and pulse until combined but not completely pulverized (you want some texture). Form the mixture into 6 patties (I find that doing this with slightly wet hands makes it a lot easier). Heat a large skillet over medium heat and drizzle with olive oil. Cook the patties until they are golden and warmed through, about 3 minutes per side. 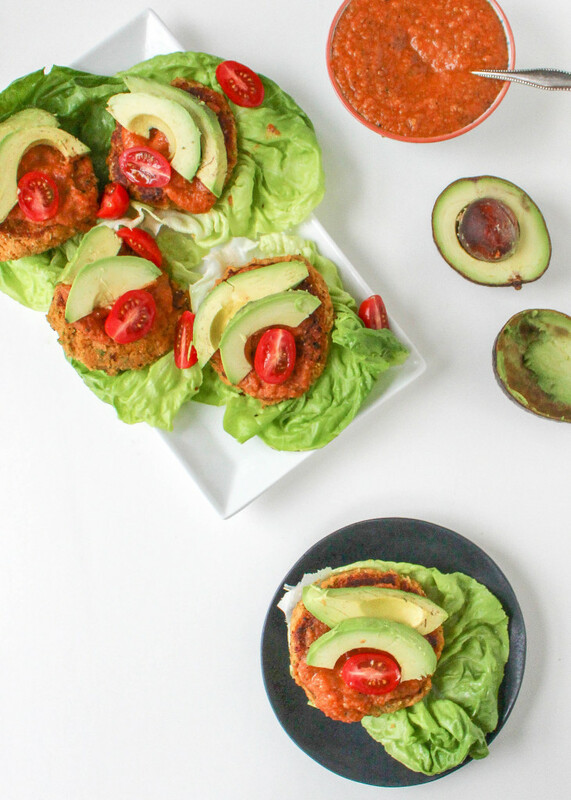 Place each burger patty in a couple lettuce leaves, top with the salsa, sliced avocado, sliced tomatoes, and a handful of crushed tortilla chips. Serve warm! Burger base adapted from here.